We present a coalgebraic generalisation of Fischer and Ladner's Propositional Dynamic Logic (PDL) and Parikh's Game Logic (GL). 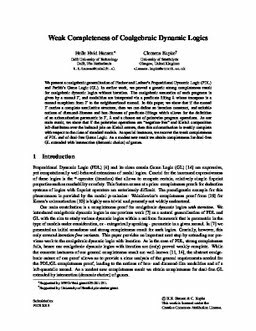 In earlier work, we proved a generic strong completeness result for coalgebraic dynamic logics without iteration. The coalgebraic semantics of such programs is given by a monad T, and modalities are interpreted via a predicate lifting Î» whose transpose is a monad morphism from T to the neighbourhood monad. In this paper, we show that if the monad T carries a complete semilattice structure, then we can define an iteration construct, and suitable notions of diamond-likeness and box-likeness of predicate-liftings which allows for the definition of an axiomatisation parametric in T, Î» and a chosen set of pointwise program operations. As our main result, we show that if the pointwise operations are "negation-free" and Kleisli composition left-distributes over the induced join on Kleisli arrows, then this axiomatisation is weakly complete with respect to the class of standard models. As special instances, we recover the weak completeness of PDL and of dual-free Game Logic. As a modest new result we obtain completeness for dual-free GL extended with intersection (demonic choice) of games.